One of AGT’s specialization is to source for dish head made of special steels and require thick steel materials with large diameters. 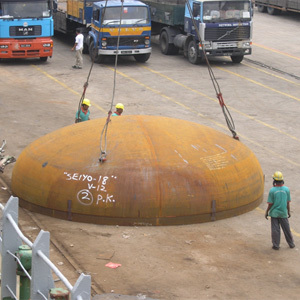 In 2007, AGT imported via North Port in Klang two dish heads of 4.5m diameter and two of 6.5m diameter in size with a weight of 3,980 kg and 5,330 kg respectively. AGT arranged for this purchase for local pressure vessel and heat exchanger manufacturers who supply to oil & gas companies. A number of vessels are currently being manufactured in Malaysia for export to other countries in the region, Middle East, Europe and America.